A workout in a pan. 3.7 lbs of sweetness. 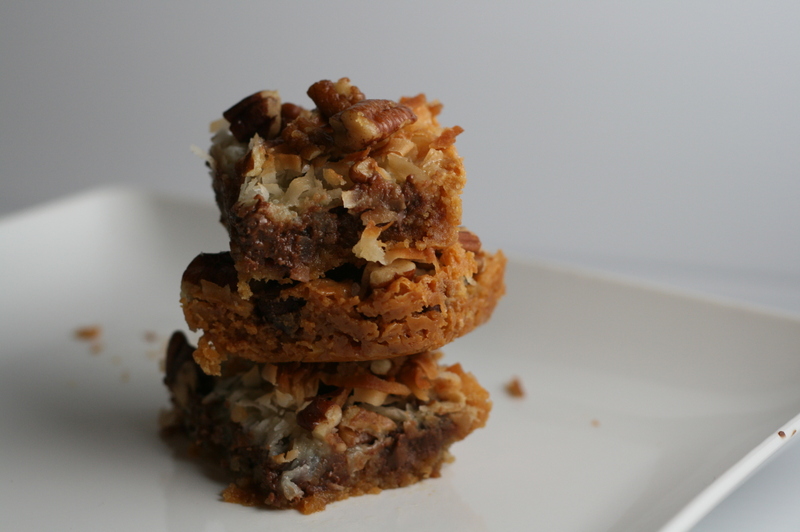 If all things today can be retro or vintage, I would say that Magic Bars (aka: Seven Layer Bars, Dream Bars, Hello Dolly Bars, The Recipe On The Condensed Milk Can Bars) are a very retro cookie. A classic. There are 3.7 pounds of toothaching goodness in a slab. A childhood memory at Christmas and we’re talking about the ’70’s so that’s totally vintage. These are a classic like having Al Green or Van Morrison in your iTunes. 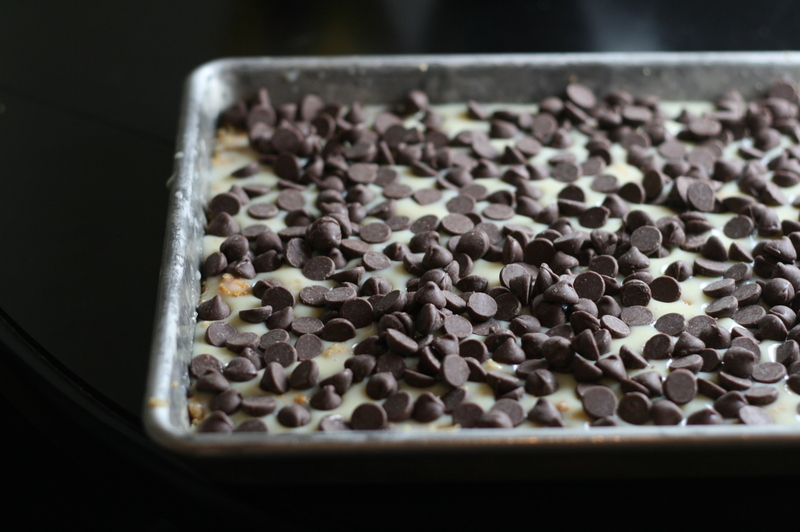 A holiday cookie platter would be very sad and lonely without its super rich chocolate, coconut laden friend: Magic Bar. 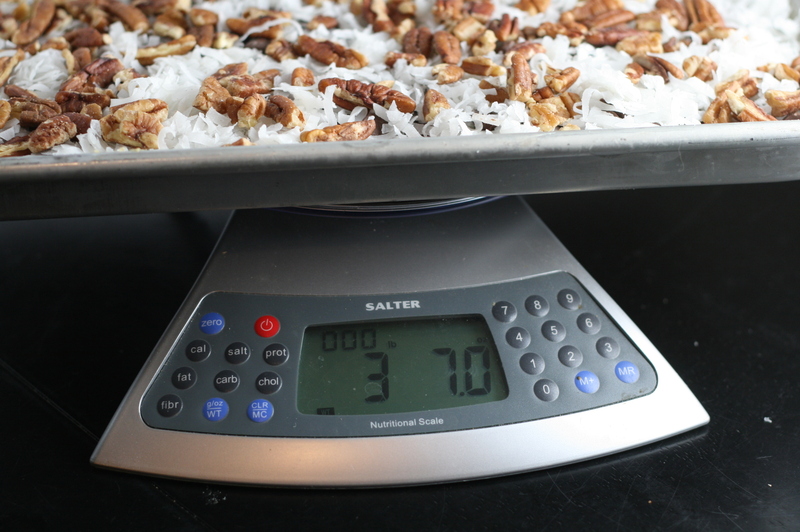 I baked these little workout beauties (3.7 lbs before baking…You could do some serious bicep curls with this sheet pan) for my Supper Club’s Annual Cookie Exchange Brunch. Yes, a Supper Club. Fun for foodies. We’ve been meeting for about 10 years although only two of us are from the original band. As people have moved out of state over the years, we’ve happily invited in new eaters in to our little hub-bub. Meeting once a month with a food theme in mind, we’ve covered the gamut from Indian to French to Comfort Food. You name it we’ve created a menu around it and happily indulged in the results. So on to some magic. Wait no more. There are a hundred versions of out there and I used a Kraft Foods recipe with the exception of a few small tweaks. Sea Salt, sprinkle over the top after baking. See the linked article about other opinions of the salty-sweet recommendations. Helps cut some of the super-toothache sweet these bars have, I think. Melted butter and bashed graham crackers. Heat oven to 350 degrees. 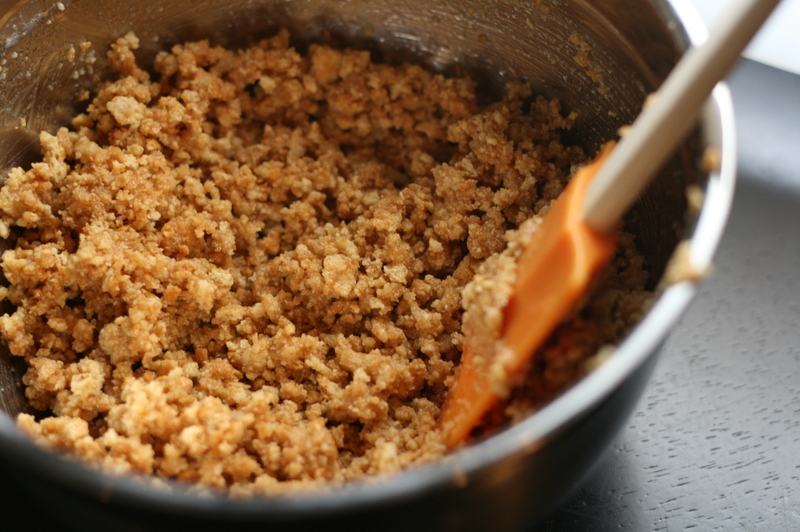 Mix graham cracker crumbs and butter in a small bowl. Press onto the bottom of a 13×9 inch pay sprayed with cookie spray. Building the foundation. 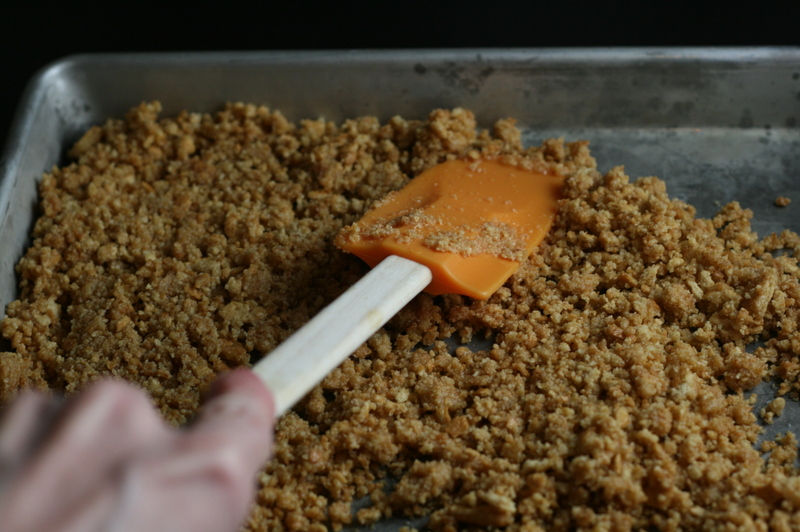 Graham Cracker Crust. Ignore the Skeletor hand. 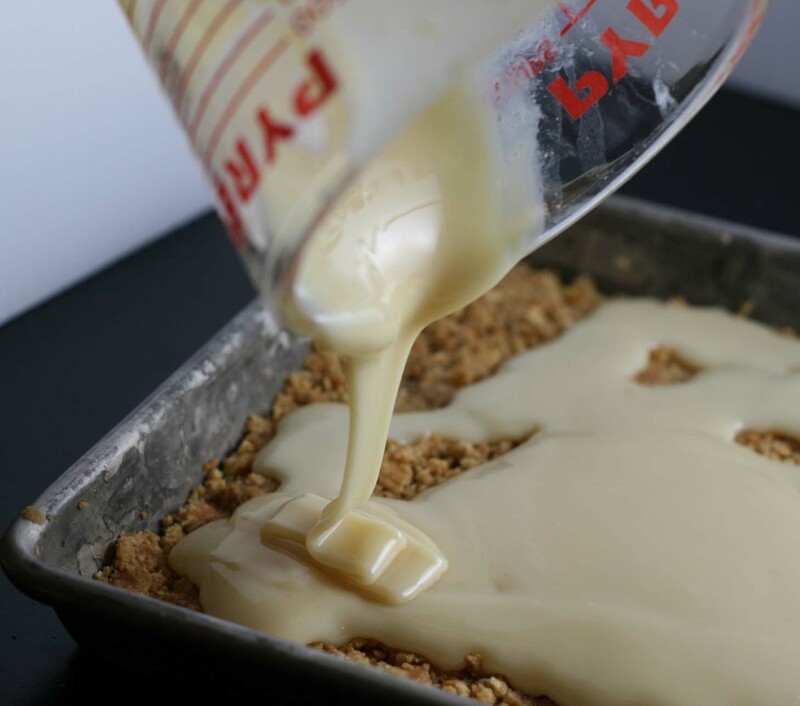 Pour condensed milk over crust. The birthday gods bestowed upon me a fun new Lowel Ego light, so needless to say, I overused it on this recipe. I think I took 60 photos of these bars in the making. Lordy that's a dirty pyrex cup. Used it to melt the butter, why wash it? It's all ending up in the same pan. 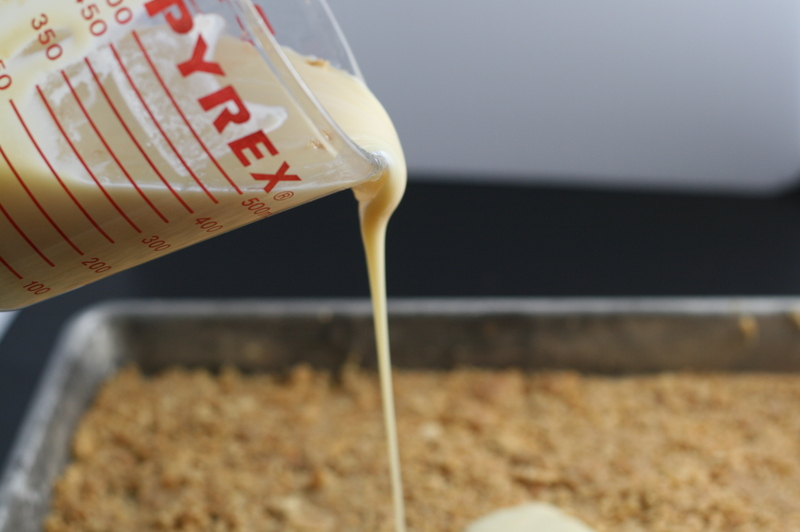 Pour condensed milk over graham cracker crust. 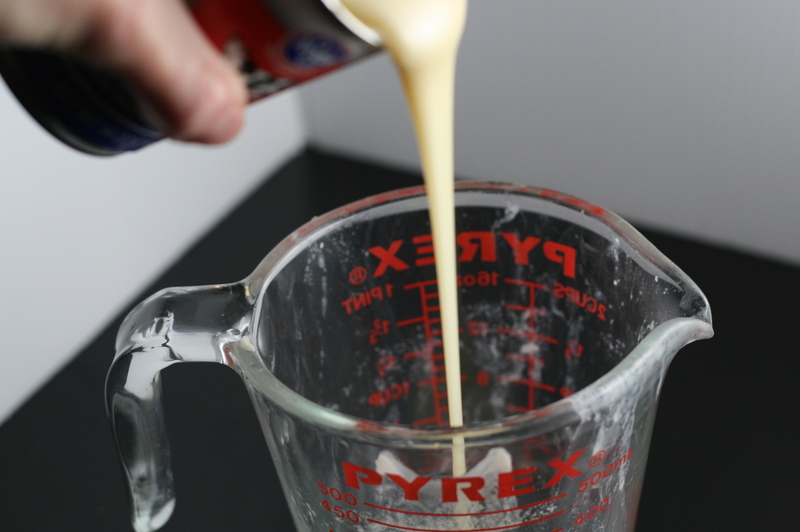 Why did I bother pouring the milk from the can into the Pyrex? Photo happy. Indulge me. The final covering. You might want to use a rubber spatula to spread around the milk so every nook and cranny gets some. Top with layers of remaining ingredients. 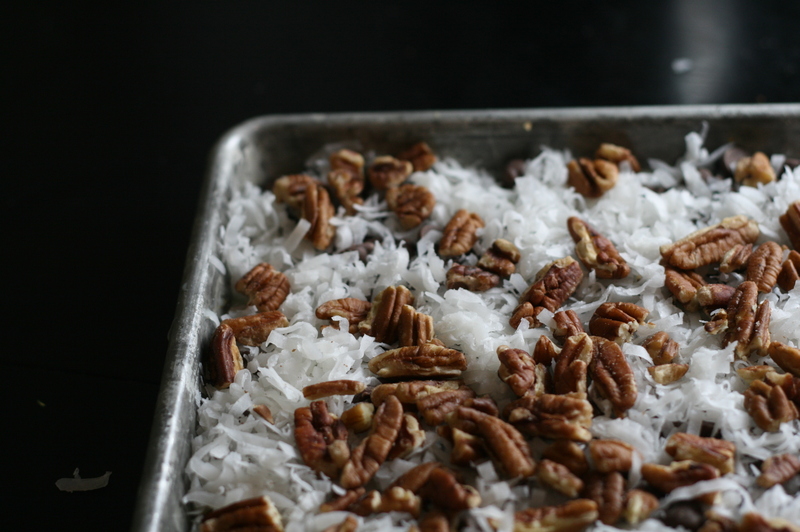 I chose chocolate first, coconut second, pecans last. 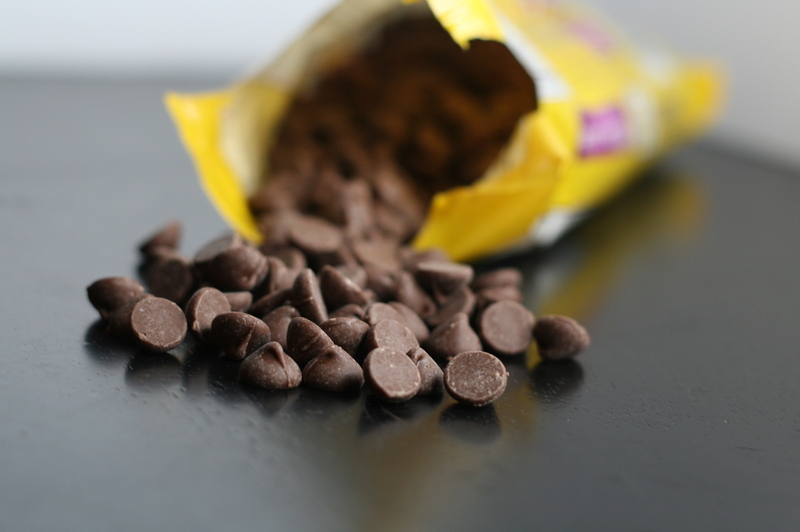 Ze Chocolat. Grab a few, nibble. They don't All have to go on the pan. 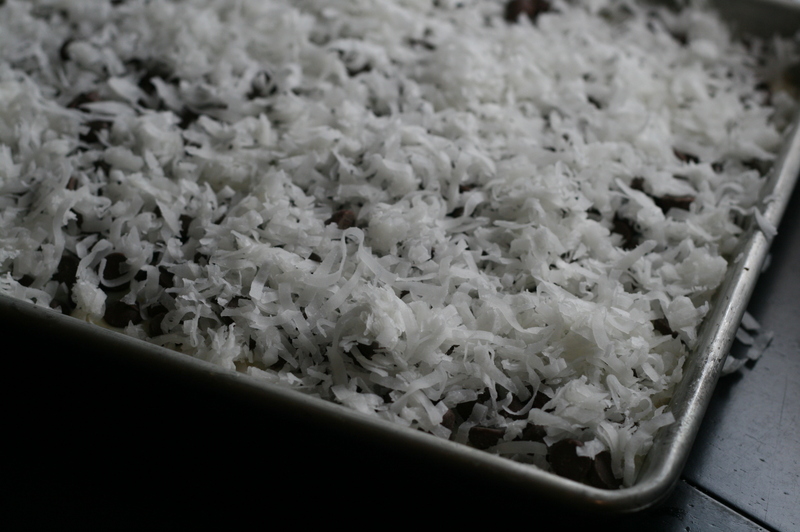 The coconut layer politely blanketing the chips. 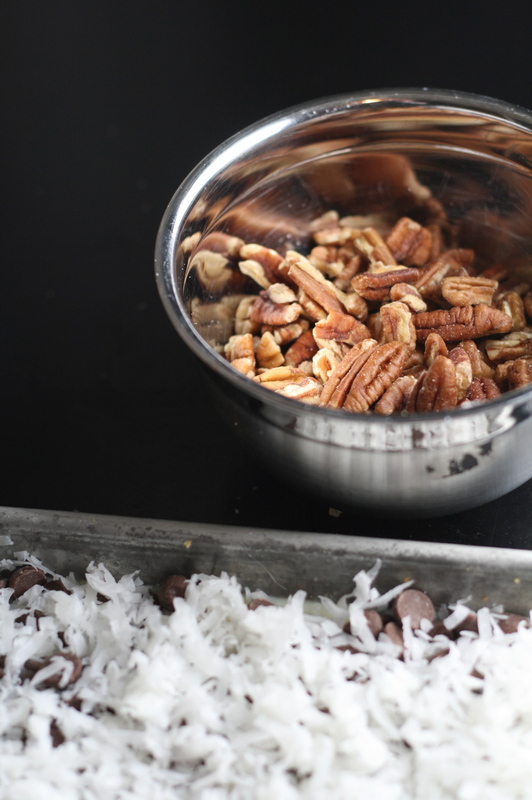 Don’t nibble the pecans. These suckers were expensive- use ’em all on your bars. Unless you have a pecan trust fund, then go wild. And now…I weighed them. I picked up this pan and couldn’t believe how heavy they were. I had to know. 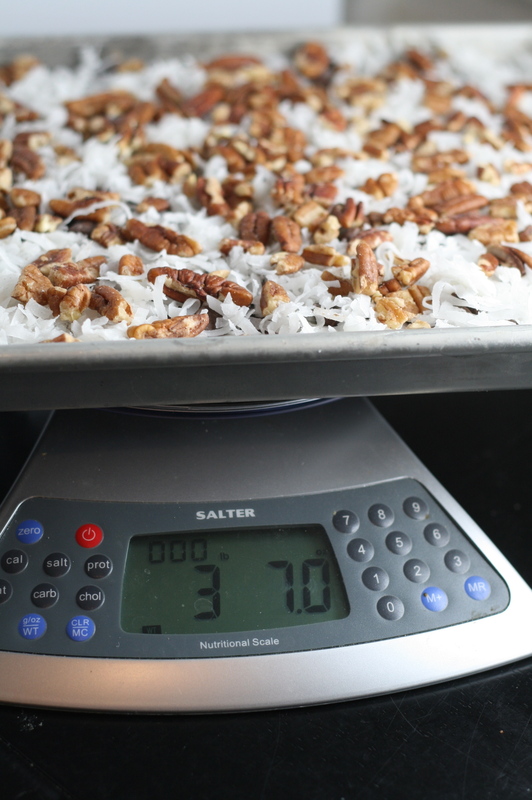 Press the pecans lightly into the coconut layer to make sure they don’t fly out of the pan in the oven. Really? No, but Kraft makes a note of this pressing business. I do, mostly, what I’m told. Bake for 30 minutes or until lightly browned. When you pull them out of the oven, run a knife around the edge of the pan so the sticky baked ingredients don’t adhere to the pan and fall apart when you take them out later. 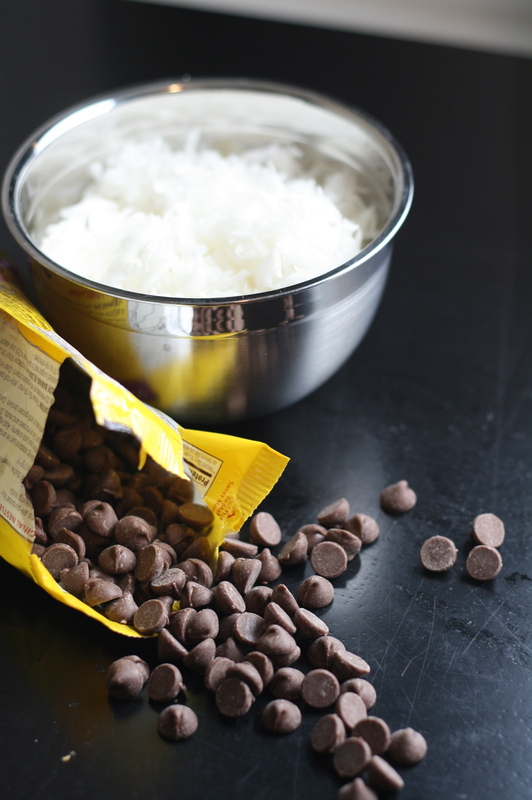 Sprinkle lightly with some sea salt if you’re feeling very gourmet. Cool completely before cutting into bars. I cut them in to smaller bars, yielding about 32 or so. They are so sweet they don’t need to be huge. Cut 'em up. Hand 'em out. Up next in cookie making: Cranberry Orange Almond Cookies (recipe via BiteClub Eats submitted by Celeste) Come back and look for it soon- delicious! 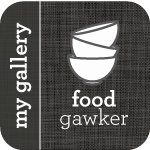 This entry was posted in Bread & Baking, Dessert, Uncategorized and tagged baking, chocolate, classic cookies, coconut, condensed milk, cookie, dessert, dream bar, holiday cookies, magic bar. Bookmark the permalink.